Dairy free pesto that doesn’t have any parmesan cheese in it, making it paleo, whole30 and vegan. But still so delicious, you won’t even miss the cheese! Go in your closet and get rid of everything you don’t like. All the clothes that are too big, or too small, or have that stain on it, or you don’t feel cute in. Get them out of your closet. I just did this, and it is the best feeling in the world. 5 garbage bags later, (yes, 5) my closet is now devoid of all those clothes that I constantly skip over when I get dressed. If it was an item that I hesitate even for a second about wearing, it went straight to the donate pile. Now when I reach in to my closet, anything I touch is something that I will actually wear and feel cute and comfortable in. I could pick out my clothes blindfolded and be happy with what I grabbed. I don’t need any more of those low cut sequined tops that I wore out dancing when I was 21. I don’t need those extra low cut jeans that hit me right on my ultra sensitive c-section scar. I don’t need those knee high boots where the heel is kind of broken. And I especially don’t need that white shirt that I used to love, but has a mustard stain on it after that baseball game. My closet is now clean and organized, and I don’t miss the old stuff one bit. You know what else I don’t really miss? Dairy. I haven’t had dairy in 5 months (since the baby has a sensitivity to it), and it hasn’t really been an issue. Just a few minor adjustments, and for the time being we are a dairy free household. 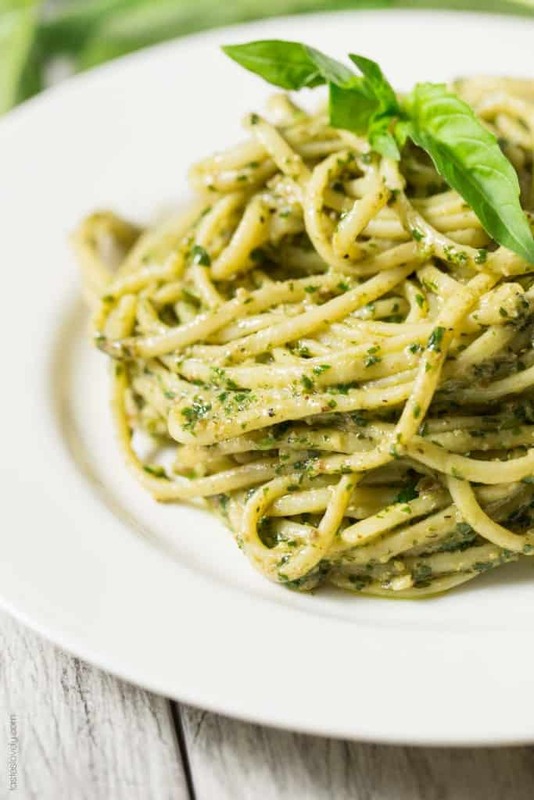 Take this dairy free pesto for example. I just left the parmesan out of my go-to pesto recipe, and I can’t even tell the difference. Now it has fewer calories, and by leaving out the cheese it is paleo, Whole30 and vegan. And most importantly, delicious! Most dairy free pesto recipes call for nutritional yeast, which I like but I don’t love. 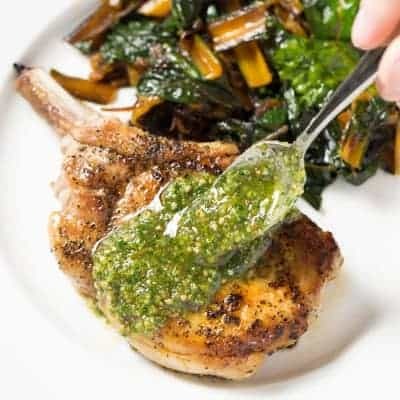 I’ve tried this pesto both ways, and I actually prefer it without the nutritional yeast. I use toasted pecans in my pesto, because I love the flavor of pecans and they are much more affordable than pine nuts. But you could substitute pine nuts or almonds or even walnuts! Use whichever you have on hand. I do add in more salt than I would if this pesto did have parmesan, but since it doesn’t have parmesan it can use the extra saltiness. I love this dairy free pesto served on whole grain pasta, zucchini pasta, grilled meats, and vegetables. Also, this pesto freezes BEAUTIFULLY! 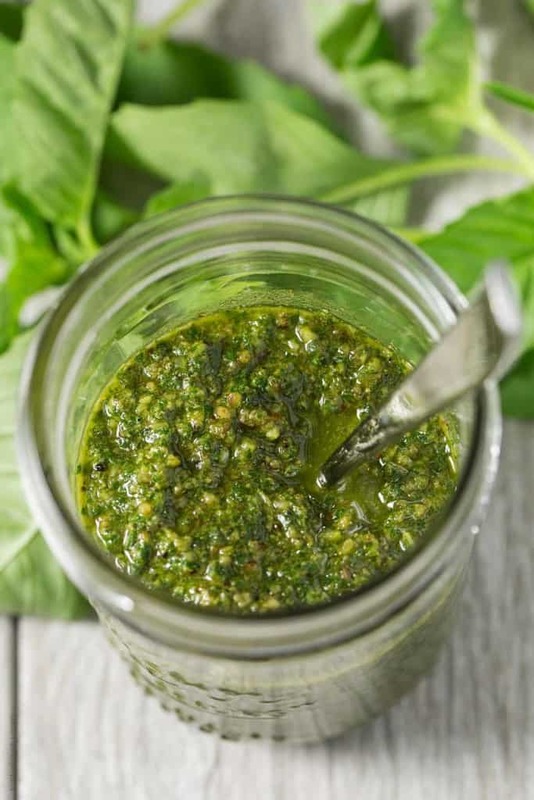 I store all my homemade dairy free pesto in wide mouth pint mason jars, which are freezer safe. In the summer when I have an abundance of basil in my garden, I make lots of pesto and freeze it so I can enjoy it all winter long! 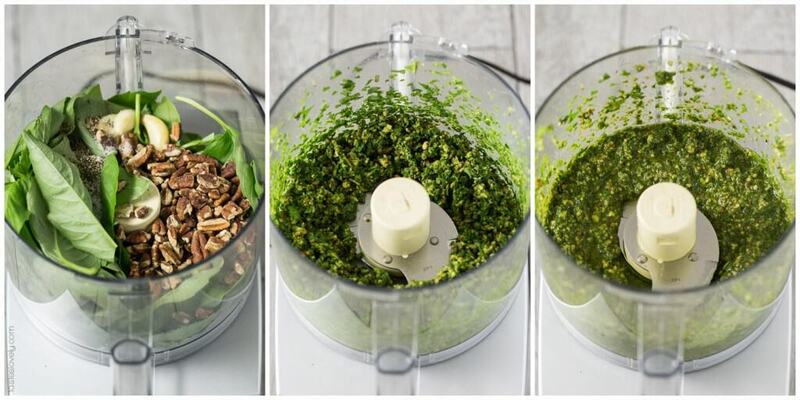 In a food processor, combine the basil, pecans, garlic, salt and pepper. Pulse until all the ingredients are finely chopped. Add in the olive oil, and pulse another 10-15 times until combined. Makes about 2 cups. Will keep in an airtight container in the refrigerator for 2 weeks, or in the freezer for up to 1 year. 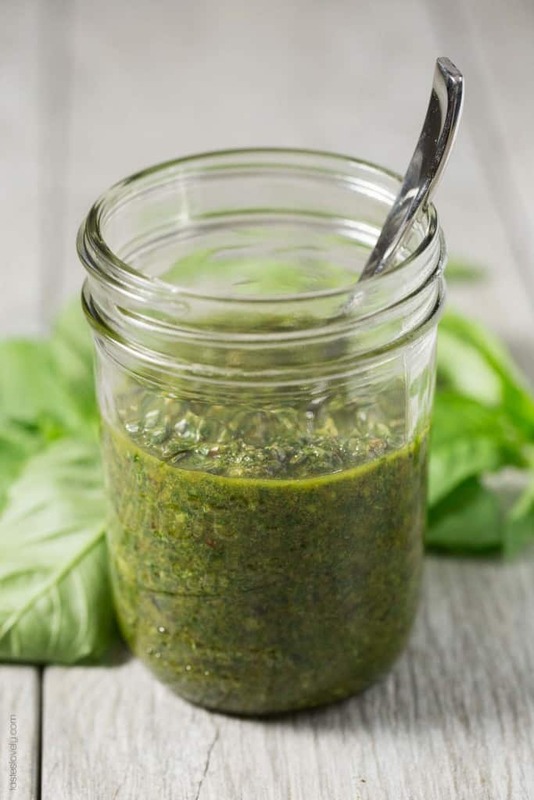 I store my dairy free pesto in wide mouth pint size mason jars since they’re freezer friendly! You’ve joined the dairy-free club ;) Not too bad right? I save my dairy intake for two things that are worth a potential stomachache: pizza and ice cream. Sometimes a girl has got to have them! I’ve been cleaning out my closet too- but I have a hard time being ruthless, so I’ve made piles and decided if I don’t think about them for 2 months, then they are headed out of the house. More room for shopping anyways! I’m going to try your pesto with the toasted pecans – sounds delish! Not too bad at all! But I’m definitely making a running list of allllll the things I’m going to eat when I can have dairy again. Pizza and ice cream for SURE! I just made pesto a few weeks ago and I’m hooked! So much better than the store bought kind. This dairy free version sounds delicious! And I LOVE cleaning out my closet (and organizing). It’s very therapeutic for me! So much better than store bought. And takes minutes to make! We just planted a ton of basil in our garden, so I know we’ll be having lots of fresh pesto in our future. Thanks for always reading and commenting Gayle! You’re the best! I had to cut out dairy with Kai too. Reflux? Well he is good to go on dairy now and loves cheese and cow’s milk…you’d never guess he was sensitive! Love the looks of this pesto, I haven’t made any in ages, and this is screaming my name! MAJOR reflux. Like, Josh spits up probably 20 times a day. It’s crazy. He goes through a LOT of onsies! It won’t last forever, right? You would love this Denise! Nothing like pesto in the spring! My little girl is sensitive to dairy so I’ve cut it out of my diet for about a week now. I’m also trying to be careful with tomatoes. I want macaroni so bad and was thinking pesto might be nice, but then I remembered the cheese!! I’m so glad I came across this! I also like that you use pecans instead on pignoli– much more affordable! I will be trying this after my next grocery run. Not rude at all. Pesto is Pesto! This. Is a lovely Pesto replacement for the lactose intolerant! This tastes just like regular pesto! I made it using pinenuts. I made homemade pesto couple weeks ago and I loved it. 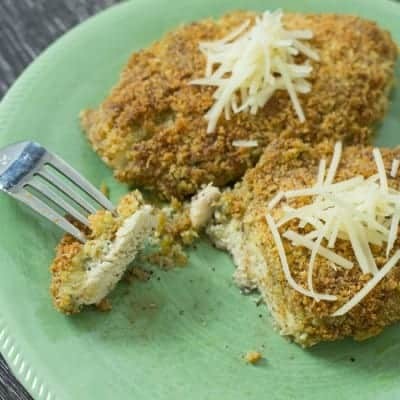 This time I wanted to try the dairy free version but I must say I do feel the difference in taste and consistency (I liked the version with parmesan better) and I am dissapointed by this recipe. Hopefully I can find a recipe that will work better without dairy. Good idea about freezing it though. 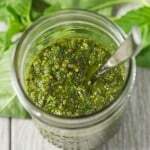 Great way to have homemade pesto in winter. Sorry it wasn’t your favorite! We love it! I don’t even miss the parmesan, but we don’t eat dairy at all so it’s been a while. And yes, freezing it is so great! 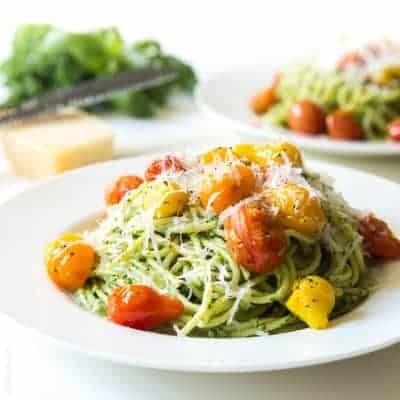 This is by far the best vegan pesto recipe I’ve found! However, when I make it I get just shy of 1 cup…no where near 2 cups so that was a bit misleading. Yea! I’m so glad you liked it! I made dairy free pesto for years. Instead of adding the salt and parmesan cheese, try miso. It is perfect and rounds out the taste. What a great idea to add miso! Good tip Barbara! If soy in your diet isn’t an issue, it will work perfect! And I just sent you an email to confirm your email subscription. Let me know if you have any other issues! Love love loved this recipe. Added a pinch of Tarragon, Rosemary and Mint only because i have it in the garden. I used pine nuts and swapped out olive oil with Coco Earth Premium Liquid Coconut Oil. It worked a treat. Went so great with cherry tomatoes and penne pasta. Simple and delish served hot or cold. I’m so glad you liked it Tess! And adding those extra herbs sounds delicious. I want to try that next time! Never thought to make this with coconut oil. What a great idea! Does the coconut oil stay liquid when refrigerated? I must try this! I am dairy free due to my baby’s milk allergy. I honestly didn’t even know there was cheese in pesto until I read the label at the grocery store and realized I couldn’t eat it. I looked up dairy free pesto and found this. I was very pleased with the outcome!! Thank you for sharing this. That’s why I went dairy free too! It was giving my first born acid reflux! Isn’t there dairy in SO. MANY. THINGS?! Luckily this pesto still tastes amazing without the dairy. Glad you found it and are enjoying! Thanks for taking the time to let me know you liked my recipe! Made my day!